TAC Series Toggle and Rocker Valves by Humphrey Products are the smallest of the series with 10-32 UNF port and orifice sizes. The TAC2 Valves are larger in size and flow with ⅛" pipe ports and orifice sizes. The TAC Series provides Total Air Control via all components for pneumatic logic circuits (i.e: various actuators, circuit components and fittings). Their unique poppet or spool designs provide smooth performance, reliability and long service life. Models 41T** and 41R** are 3-position, 4-way valves with several functions. 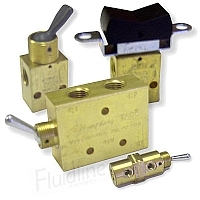 They may be detented or spring return or both, and can be used as 2-position valves by bypassing position #2. They can be used as 3-way valves by plugging A or B port. All models can be panel or side mounted.